You may remember Charles Murray from his controversial 1994 book The Bell Curve wherein he proposed that Blacks are intellectually inferior to Whites. Now he takes a loot at White America and posits that White America, and America itself, is coming apart because of the widening gap between the classes. Murray observes that the problems of (1) a lack of religion, (2) lack of respect for marriage, (3) lack of respect for the law and (4) lack of ambition to work are disproportionately affecting lower class Whites more than upper class Whites. Working class Whites are more likely to have children out of wedlock, draw unemployment or worker's compensation, and consume other government entitlements. Murray argues that the economy is not to blame for the fact that many working class Whites are unemployed. Instead, he argues that they are unemployed because most of them are simply not looking hard enough for work. Murray observes that upper class Whites suffer far less from these 4 problems but they have retreated to live secluded lives amongst each other in suburban communities far away from working class Whites. Because of this seclusion, according to Murray, upper class Whites no longer share the living example of their success on these 4 fronts with their working class brethren. 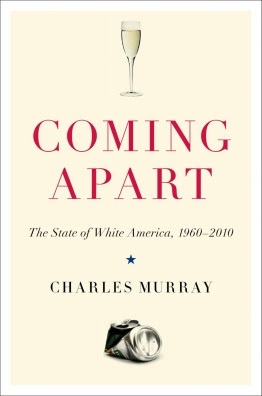 Furthermore, Murray argues that upper class Whites not only fail to share these 4 critical practices with working class Whites, but that upper class Whites no longer feel it is their duty to do so. They (1) go to church, (2) get married, (3) respect the law and (4) hold down good jobs but they don't agree that the working class Whites need to do the same thing. And thus, White America is "coming apart." This begs the question, was there ever a time when upper class Whites "looked out" for working class Whites? Are these dynamics unique to Whites or do they apply to all races across the board? Are working class Whites unemployed due to a lack of searching for work?